This release was issued after Bank of America expanded its commitment to provide accessible services by signing a national Talking ATM agreement in which it agreed to install Talking ATMs at 85% of its locations in the United States. The agreement, negotiated in the year following first Bank of America Settlement Agreement was negotiated by Lainey and co-counsel Linda Dardarian using Structured Negotiations. In early 2008, Bank of America has over 11,0000 Talking ATMs. Charlotte, N.C. (October 4, 2001) — Bank of America today reconfirmed its commitment to the visually impaired community by announcing plans to install more than 7,000 Talking ATMs coast to coast. With a total of more than 3,000 talking ATMs planned by the end of 2002, the rollout is expected to be complete by the end of 2005. The bank currently has 500 Talking ATMs installed in Florida and California. The aggressive plan reinforces Bank of Americas objective of continuing to lead the industry in pioneering Talking ATMs nationwide. Furthering its long-standing commitment to the Talking ATM deployment effort, Bank of America is implementing technological innovations not found in earlier generations of machines. These features, which will make Bank of America Talking ATMs among the most advanced in the industry, include efforts in volume control, spoken balance and voice synthesis. Bank of America continues to take a leadership role in the development and installation of Talking ATMs and we congratulate them on todays announcement, said Christopher Gray, national president of the American Council of the Blind. This unparalleled action solidifies and magnifies Bank of Americas reputation in serving the blind community. Talking ATMs are part of a broader initiative at Bank of America to make banking work in ways it has never before. Accessible banking services for customers with vision impairments include account statements available in Braille and large print and raised line checks. The bank is also taking further steps to ensure that its Web site and online banking services are W3-C compliant, making them accessible to visually impaired persons whose personal computers use screen readers to audibly read text on a computer screen. Bank of America continues to set the standard in the industry with innovative programs that aim to better serve our customers who are visually impaired, said Bill Raymond, manager, ATM Channel Strategies and Development at Bank of America. Talking ATMs along with compliant web pages, specialized statements and other initiatives further demonstrate our commitment to serving our customers and how we are embracing ingenuity to make their lives easier. Talking ATMs provide audible instructions to persons who cannot view information on an ATM screen. These machines make it easier for vision-impaired users to withdraw cash, deposit money and perform other ATM transactions. 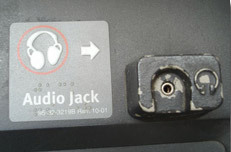 The ATMs have audio jacks that deliver spoken instructions through standard headsets to protect the security of users who are blind or have low-vision. Those wishing to obtain additional information about Talking ATMs can call 1.800.299.BANK. California customers can contact Bank of America at 1.800.ENABLEU for assistance. To locate a Bank of America talking ATM visit www.bankofamerica.com. One of the world’s leading financial services companies, Bank of America is committed to making banking work for customers like it never has before. Through innovative technologies and the ingenuity of its people, Bank of America provides individuals, small businesses and commercial, corporate and institutional clients across the United States and around the world new and better ways to manage their financial lives. The company enables customers to do their banking and investing whenever, wherever and however they choose through the nation’s largest financial services network, including approximately 4,400 domestic offices and 13,000 ATMs, as well as 38 international offices serving clients in 190 countries, and an Internet Web site that provides online access for more than 3 million customers, more than any other bank. The American Council of the Blind (ACB) is a national membership organization of people who are blind and visually impaired. ACB has 51 state and regional affiliates and 20 national special interest and professional affiliates across the United States. ACB advocates for the well being of blind persons in areas including accessible ATMs, pedestrian safety, quality work skills training, accessible computer environments and more. ACB can be reached at www.ACB.org.